Befrienders are often the first person a member will speak to about being worried about their memory. Talking to family or a GP is often, put simply, too scary. The fear of being shrugged off or even being judged is a powerful deterent. "Sometimes I have a bad time with my husband, his dementia, and just being able to talk about it relieves some of the pressure. I can end up laughing about it and that means I can do it all again tomorrow. By joining the Good Morning Community members extend their social network. The importance of maintaining social networks as we get older is recognised not least as a key factor in life satisfaction and happiness but, as a potential factor in reducing the risk of developing dementia in later life. Our motto: "5 conversations a day are as important to your health as 5 fruit and veg!" The North Dementia Forum is a collaboration between professionals and carers in North Glasgow working to improve the quality of care for people with dementia and their carers. The Forum produced an award-winning film, "Changed Days"(2011), which highlights the implications of dementia for those who have the illness and their carers. The message is relevant to those working in health and social care provision and the wider public. It can show us all how we can relate to people with dementia and how we can support their carers. To obtain a free copy of the film DVD please contact us. Click on the link to download the User Notes to accompany the film (PDF 4.9Mb). To request a free printed copy of the User Notes please contact us. Chief executive, Nicky Thomson, wrote "Communicating With Someone Who Has Dementia: 12 Helpful Hints." in 2008. 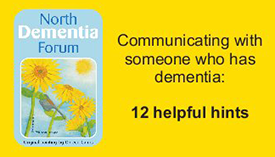 It acts as an aide memoire for anyone who has contact with someone with dementia. To date "12 helpful hints" has been widely republished by Alzheimers Scotland, Sporting Memories Network and the NHS. Click on the link to download a copy of the 12 Helpful Hints leaflet. Click on this link to download a copy of the 12 Helpful Hints poster. "Every time someone asks how I cope looking after my dad I show them this leaflet. I show everybody, every body should have one: bus drivers, shopkeepers, cafe staff, you name it."